Drive the super fast race cars and see if you could have been or perhaps still can become the world's best racer. This fabulous 3D game will put you to a test of speed and skill. With 12 fastest race cars to choose from, a number of bonuses to help you win and various difficulty levels to help you improve, participate in over 50 tournaments and win the grand prix. Compete on a variety of race tracks in different weather conditions and climates and prove that you are really fast and furious in this free full version game! Free Game Features: - Real racing game, vehicular combat; - Modern 3D graphics; - Extraordinarily addictive game play; - Unique power-ups; - Gorgeous effects, huge explosions! - Original soundtrack and powerful sound effects; - Unique power-ups; - Game statistics; - Free full version game without any limitations. 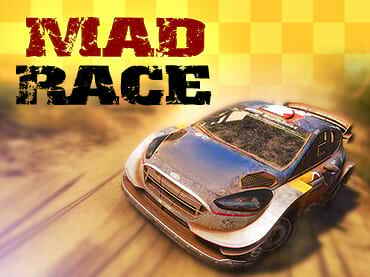 If you have questions about Mad Race game, please contact us using this form.